Apple believes that if your jailbreak your device, it gets less safe. But apparently, that’s not true – it can add more security to your device with better security apps in Cydia. With iCaughtU, a tweak for jailbroken iOS device only, you can set up your iPhone, iPad to send you a picture of whoever tries to unlock your device and enters the wrong password for a set amount of time. The tweak takes the picture using the front camera of the device and send it to your email address. The picture is also saved to the photo library. 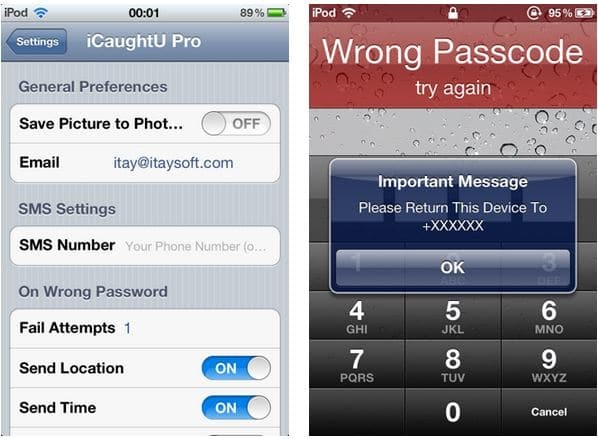 In iCaughtU, you’ll have many features to increase the chance of getting your iPhone, iPad back in case it get stolen. You can set the maximum number of attempts before it takes the picture, receive location of the device back, or send text messages to the thief when he enter the wrong passcode. Another interesting feature this tweak has is the ability control your device from home. For example, the tweak allows you to set up alarm, take pictures or turn off the device. The tweak also has a feature named FakeMode which allows access to the device even if the password is entered incorrectly but disable some apps. You can download iCaughtU Pro from Cydia’s BigBoss repo for $2.50. There also a free version, iCaughtU, with fewer features in Cydia.